Was your home built throughout the late 1970s to mid-1990s? Chances are your home plumbing was installed using polybutylene piping, otherwise known as “Poly B.” Issues have surfaced with Poly B piping, and it’s becoming so problematic that home insurance industries, like BCAA, are making changes to insurance policies related to the type of plumbing in homes. Why? 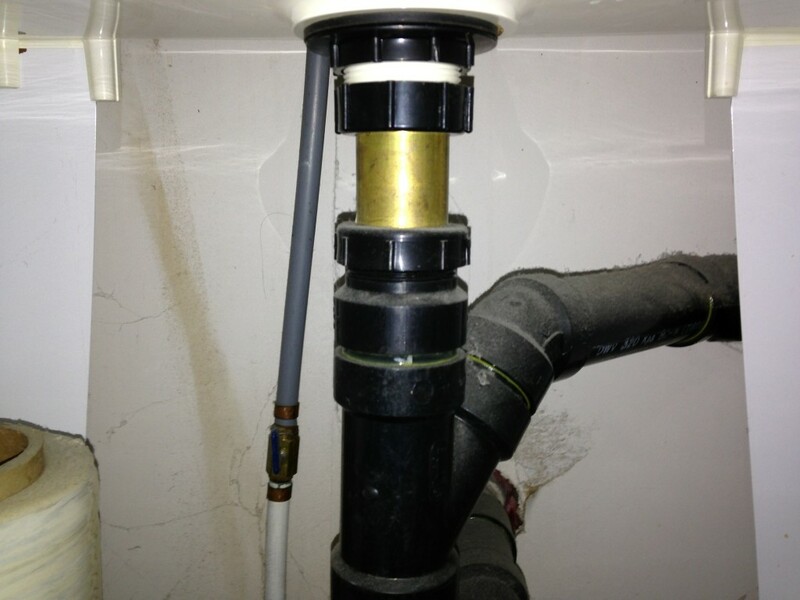 Poly B, quite simply put, has the probability of eventual failure, meaning: leaks, mold issues, hairline cracks, in-home flooding, poor water quality (irregular water pressures and chemical sensitivities, like chlorine and mineral levels), loose fittings (poor installment by plumbers), and so on. Because of this, insurance companies are seeing an increase to the number and cost of water damage claims. What’s the outcome? The insurance industry is increasing the deductible for water damage claims. One of our very own employees at JJ’s Plumbing just received a letter in the mail from BCAA saying her deductible was increasing to a whopping $5000! What’s next? She’s having her Poly B piping replaced. What can you do? Rather than simply repairing your Poly B (the band-aid solution), make the decision to replace your piping altogether. In the end, this could end up saving you thousands of dollars. Poly B pipe replacement is currently on special until April 30, 2019. Email our expert plumbers at service@jjs.plumbing, or call us at 604-479-2232. Do you have any New Year’s resolutions this year? This month, we’re sharing some plumbing resolutions that are easy to achieve in 2019. Renovate or update your bathroom or kitchen! It’s easy with our support. Now for more good news! These services are on special until April 30, 2019. So don’t hold back. Email us at service@jjs.plumbing, or call us at 604-479-2232 to get started. https://jjs.plumbing/wp-content/uploads/2019/01/January-blog-new-years-resolution.jpg 500 749 Janet Stolth https://jjs.plumbing/wp-content/uploads/2017/12/JJs-Plumbing-logo-with-tag.png Janet Stolth2019-01-17 19:23:522019-01-17 19:42:56New Year’s Resolutions for your Home! Polybutylene, otherwise known as ‘Poly­B’, is most common in homes from the late 70s to mid 90s and was used because it was inexpensive to buy and install. As time goes on, Poly-B deteriorates and can leak and cause flooding in the home if not replaced. Learn more about Poly-B Replacement on our website. The risks associated with Poly­B waterlines are flooding, increased insurance premiums, cancelled insurance coverage and costly deductibles, as well as mold infestations caused by undetected pinhole leaks within waterlines covered by drywall. The more we talk to our customers, we learn that there are common mistakes or misconceptions about Poly-B. So, we’ve compiled this list to set the record straight. Replacing Poly-B is super expensive and hard to afford. This is a common myth people have about Poly-B replacement. Replacing Poly-B is actually quite affordable, and definitely costs less than if you have a flood in your home to worry about! We know that it’s unfortunate to have to replace your pipes, but JJ’s Plumbing Experts will come up with an affordable solution for you: whether it’s replacing your pipes altogether, or repairing your existing pipes to prolong the lifespan of your Poly-B pipes until you can afford to replace them. Bottom line: there are affordable options and we can come up with one that works for you. Poly-B problems/leaks happen because of poor installation. While it’s true that you want a good pipe installer (like us! ), it isn’t typically the case that it’s the installation of Poly-B pipes that causes the leaks. Installation quality could contribute to leaks, but in most cases installation does not appear to be the primary cause. The most common reasons leaks occur are: the age of the pipes, water quality/chlorine levels and degeneration of piping. The Poly-B pipes in my home have lasted for nearly a decade, so they are just fine. Thinking this way is just waiting for disaster to occur. Most of the time, it takes many years for Poly-B piping systems to leak or fail. Many leaks start to happen in 10-15 years from installation of the piping system, so if you’ve had them installed for a decade or longer, it’s time to start thinking about a replacement. Do you have Poly-B piping and would like to know if you should have a replacement soon? Call us at 604-479-2232 or email service@jjs.plumbing and we’ll help you find out. Polyvinyl chloride (PVC) piping is used for a variety of household plumbing tasks. 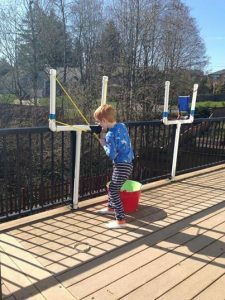 Normally, people think of this material as a practical resource, but just for the fun of it, we’re sharing how PVC piping can also be a perfect supply for do it yourself (DIY) projects made for you or your kids! Here are 5 DIY projects with PVC Piping (though the many options are truly endless). Fun for the kids this spring and summer! How about something new for the kids this spring or summer? 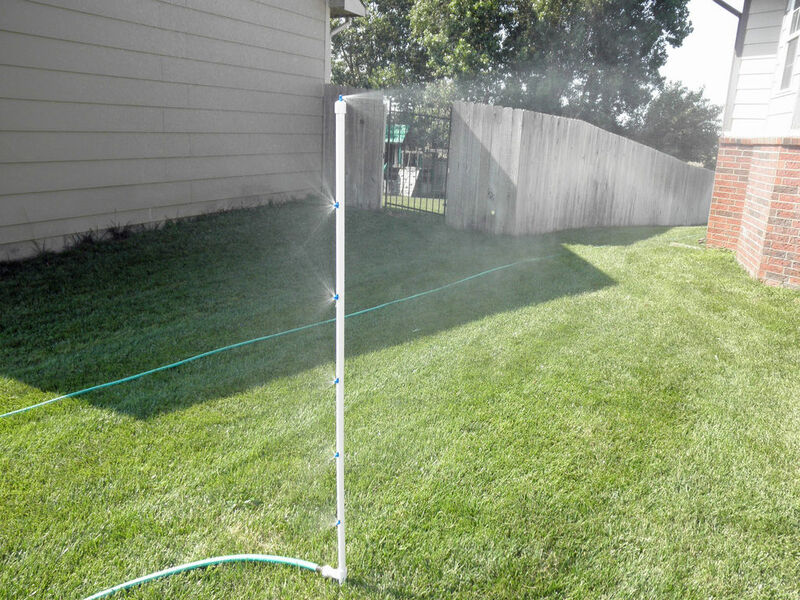 Turn PVC pipes into a special misting sprinkler for them to run through in the yard! 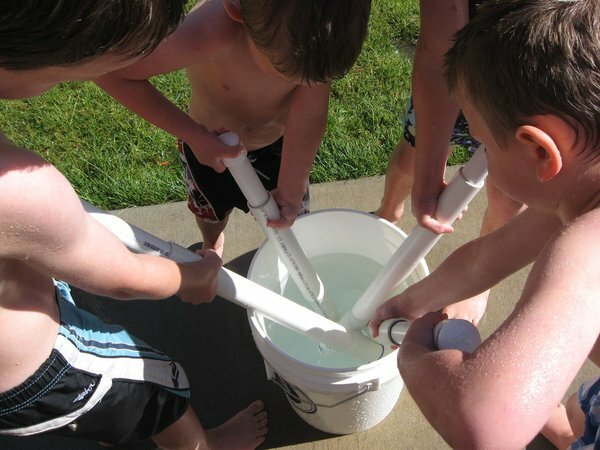 Or master the art of water balloon fights with the creation of giant slingshots. Two easy DIY projects that will keep them smiling (and out of your hair)! 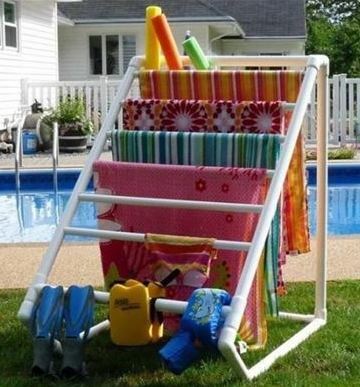 Here’s a simple and cheap way to create a practical towel rack for beside the pool or in the backyard. Make it as tall as you wish, with as many racks as you’d like! 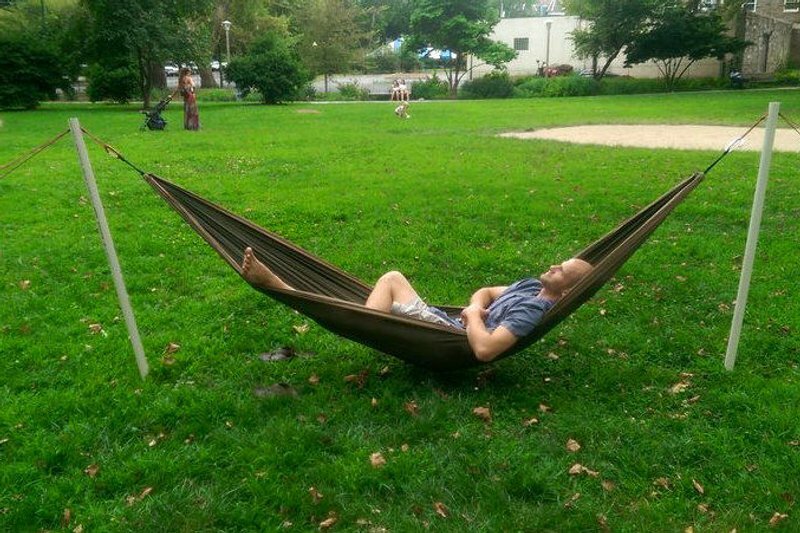 Plus it’s nice and sturdy. You can make numerous PVC bangle bracelets for literally pennies! Plan a wine & craft night with your friends. Or this is a great art project for your daughter and her friends. All you need is paint for a stylish and unique finish. 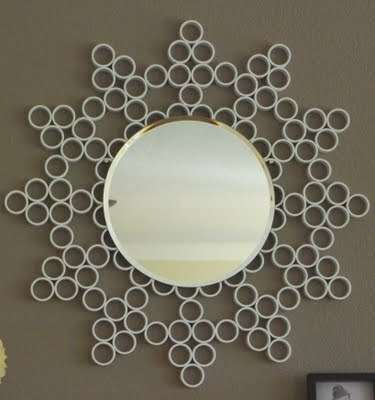 This is an easy and inexpensive way to create a fun starburst frame for a plain circular mirror. Just cut the PVC pipe, paint the pieces to your liking and glue together. 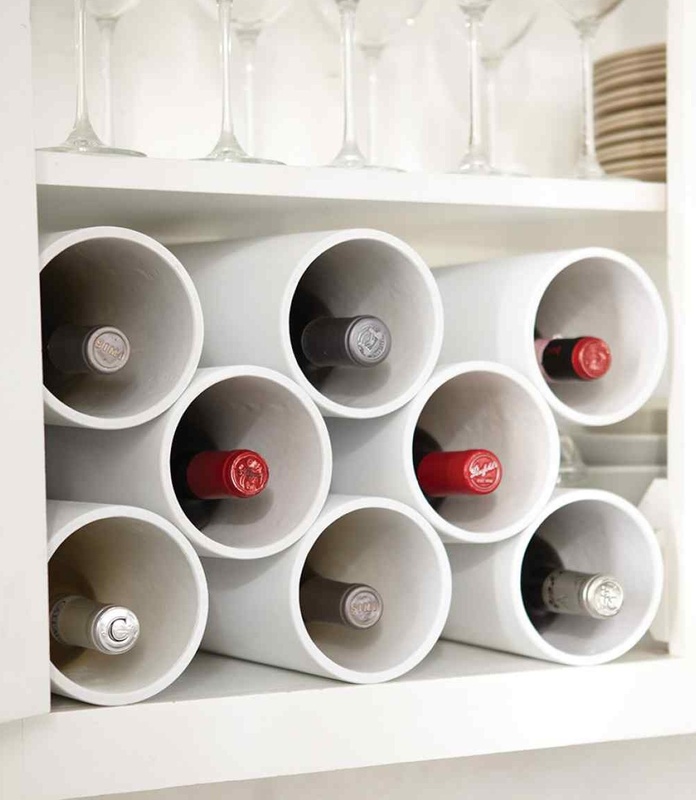 Our personal favourite—because it’s super easy and involves wine—a modern wine rack, all made from PVC pipe! How could you say no to this project? Enjoyed this fun and creative article, but have some specific plumbing inquiries? Give us a call at 604-479-2232 or email service@jjs.plumbing. Guess what? JJ’s Plumbing will be exhibiting at the Ridge Meadows Home Show from May 5-7, 2017 at Planet Ice, Maple Ridge Fairgrounds. It is one of Western Canada’s largest home shows, with nearly 400 exhibitors showcasing renovations, construction, decor, furnishings, electronics, landscaping, wellness, housewares and more. Tickets are only $4. We hope to see you there! JJ’s Plumbing realizes that finding a reliable, knowledgeable, and cost efficient plumber can be hard to come by, especially being a property manager and wanting to go through the same plumbing company for your needs. JJ’s Plumbing offers reduced rates to property management companies to help successfully maintain your properties. Not only that, but we back all of our work with a one-year warranty on all workmanship. 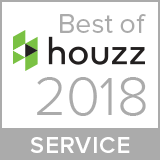 Our team can assist with the plumbing, drain cleaning and Poly B replacement needs of one rental property or multiple properties anywhere in Metro Vancouver and the Lower Mainland. CERTIFIED — We only have certified field technicians that keep up with the latest trends and project management techniques with ongoing training. You can trust that we have the expert knowledge you require. COMMITMENT TO EXCELLENCE — We are committed to producing results that can be depended on. We strive for excellence and are committed to making property managers’ jobs (and therefore, lives) easier. UP TO DATE WITH TECHNOLOGY — JJ’s Plumbing is current with the most recent plumbing technologies. We provide efficient services at a great price. GREEN INITIATIVES — We provide paperless billing, water conservation tips, and we ensure that all waste from projects get recycled. As a property manager, you have enough work on your plate, and many unforeseen issues that pop up on a day-to-day basis. Working with JJ’s Plumbing as your go-to plumber, you’ll have the peace of mind you need to trust that problems will be tended to in an urgent and professional manner. We won’t let you down and we strive to be counted on by you. We look forward to connecting with you. 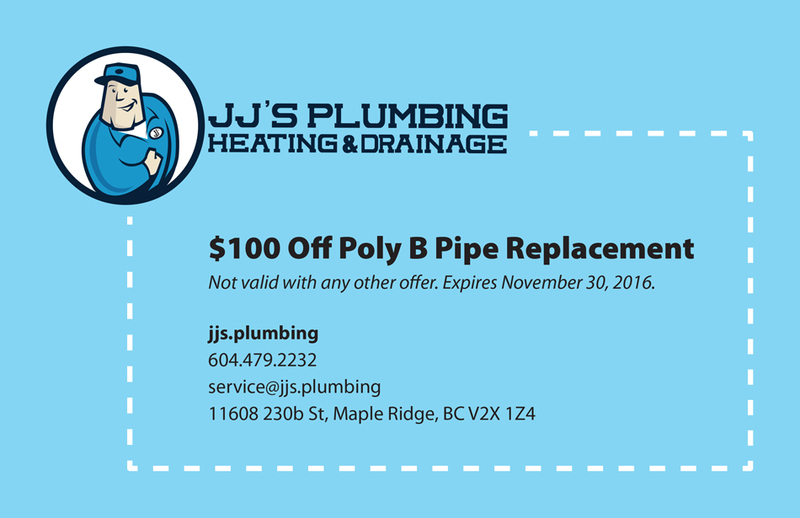 Call us now at 604-479-2232, email service@jjs.plumbing or fill out our online form and we’ll prove to be your go-to plumber. Don’t Get Denied On Your Home Insurance! Have you recently been denied insurance, or quoted a high premium due to polybutylene piping? If you own an older home, you’re probably aware of the nightmares that can go along with Poly-B piping. Poly-B piping was hailed as a cheap alternative that would revolutionize plumbing, but quickly became a nightmare. All pipes, given enough wear and tear over time, will need to be replaced. The issue with Poly-B pipes is how quickly they seem to age, and their inclination to leak. While not all Poly-B pipes will cause problems, risk factors for this older grey style of pipe includes connection failures, chlorine levels, poor installation, and proximity to heat sources. They’re linked to issues with mould and mildew, which can be a complete headache when it comes to getting home insurance or a mortgage. Many insurance companies refuse to insure homes with Poly-B pipes, or offer higher than normal rates. Fortunately, the pipes can be replaced with safer and more durable alternatives. It’s a good idea to have them replaced before they become an issue, and is a relatively easy fix. 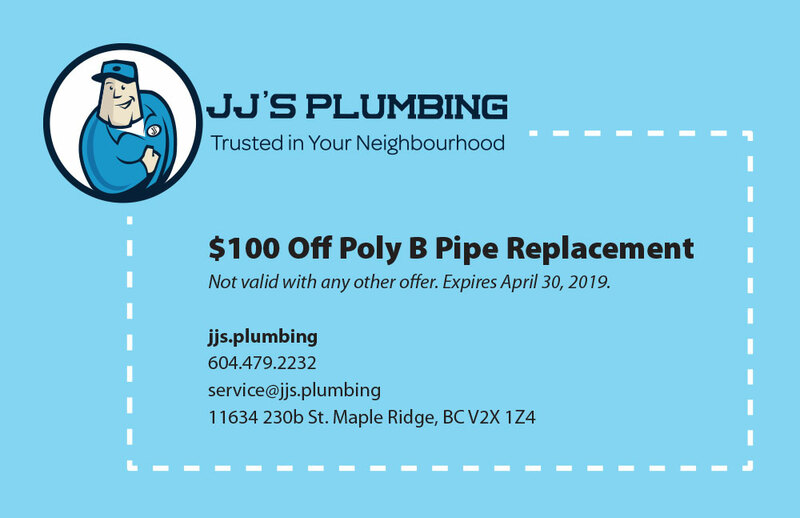 Contact us, your Vancouver Poly B Replacement Experts, to get a quote on the best way to safeguard or replace your PolyB pipes before they become a headache! https://jjs.plumbing/wp-content/uploads/2014/03/poly-b-1024x768.jpg 768 1024 jusjonadm https://jjs.plumbing/wp-content/uploads/2017/12/JJs-Plumbing-logo-with-tag.png jusjonadm2014-01-10 23:07:162014-03-18 02:17:09Don't Get Denied On Your Home Insurance! If you own a home that was built between the 70s and 90s, you’ve probably heard about PolyB, or Polybutylene piping, and the leaking and insurance nightmares that go along with it. Poly-B is a type of grey pipe used in home plumbing and water heating systems in North America that rose to popularity as an alternative to copper piping. It took decades — and millions of dollars in lawsuits — before the pipes went out of use in the 90s over safety and performance concerns. Although all pipes can and will fail and leak eventually, PolyB pipes are believed to leak at abnormal rates, and can cause nightmares for homeowners when it comes to mould, mildew, and insurance. Not all pipes will leak, however, and risk factors for PolyB pipes include connection failures, chlorine levels, poor installation, and proximity to heat sources. Many US failures have to do with piping being in attics, where it is heated excessively in the Southern sun. Far fewer incidents have been reported in Canada, although coverage by CBC Marketplace hints that the problem might be bigger than many think. Fortunately, there are many things you can do if you face problems with the pipes in your home, or wish to have them replaced before they become an issue. Contact us, your Vancouver and Naniamo Poly B Replacement Experts, to get a quote on the best way to safeguard or replace your PolyB pipes before they become a headache!